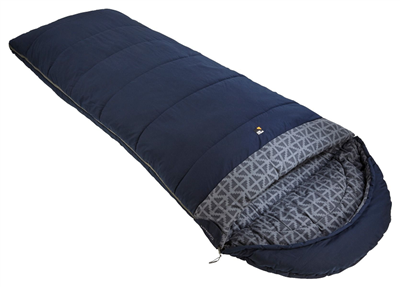 With a double layered top and base providing comfort and maximum warmth,the Comfort series sleeping bags are designed to feel luxurious and make you feel at home during nights away in your caravan or under canvas. When all you want is to feel at home surrounded by a big duvet and your main criteria is warmth then a Comfort sleeping bag is the one for you. Sprayway's very best Inso/Therm polyester synthetic fill combined with an offset double layered construction offers maximum warmth and comfort. Soft handle Polycotton outer is quick drying and durable, while printed cotton flannel lining is luxurious soft so you will be guaranteed to get a good nights sleep. Available in 3 fits to suit the requirements of the family from a double through to the all-important Junior for the smaller campers amongst us.